Jack Henry & Associates named a top workplace by The San Diego Union-Tribune. CFO Tech Outlook features PayStand. Raketech partners with Trustly for in-banner Pay N Play technology. Banco Original chooses FICO to launch digital platform. 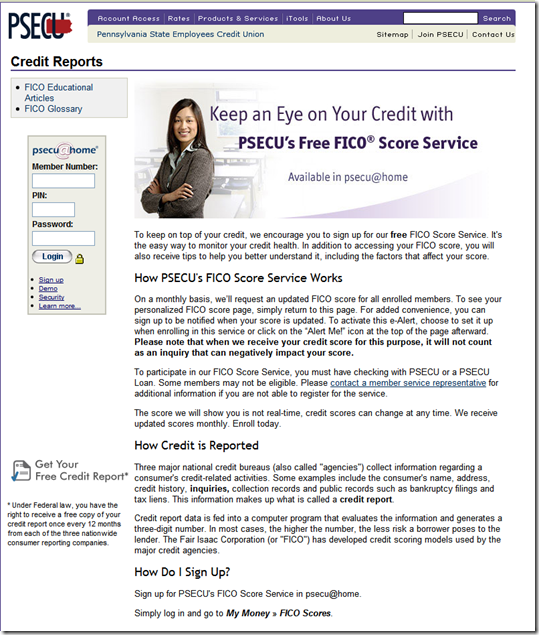 In what I hope is the beginning of a trend, Pennsylvania State Employees Credit Union (PSECU) is offering free FICO credit scores to its online banking customers. The CU says more than 200,000 members are eligible to receive free scores. Although, Wamu and HSBC (note 1) both offer free scores for their respective credit card customers, PSECU is the first financial institution to offer scores to checking account customers within the online banking area. There is no charge for the service, but members must enroll to participate. A new score will be posted online each month in the online banking area. Members also have the option to receive alerts when their scores are updated. The service is powered by Fair Isaac’s MyFICO service. According its press released today, the company is talking with other financial institutions about participating in the Scores on Statements program. Currently, 1.5 million consumers have access to free credit scores through the service. Bottom line: Without knowing the financial arrangements, it’s impossible to estimate the ROI. But credit scores have real value to consumers and any financial institution providing them for free is likely to improve its standing. It’s also possible that a free credit score service could be a profit center if fee-based credit report monitoring options are marketed to enrollees of the free service (note 2). 1. Only HSBC’s Sears Solution MasterCard includes the free scores. 2. See our Online Banking Report on Credit Report Monitoring for more information on the opportunities for retail banks and credit unions.